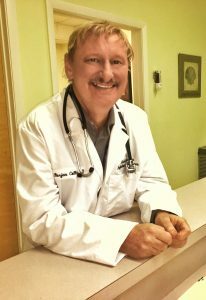 Dr. Collin, practices as an Infectious Disease Specialist in Port Saint Lucie, FL. Dr. Collin, graduated from Vrije Univ Brussel, Fac Van De Geneeskunde En De Farm, Brussel. Dr. Rodriguez, studied at La Sabana University, in Chía, Cundinamarca, Colombia. She completed her Residency in Internal Medicine at Jersey City Medical Center, in Jersey City, New Jersey. Dr. Rodriguez worked as a Hospitalist in Fort Pierce since 2013. 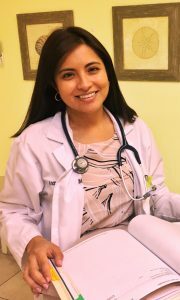 She completed her Fellowship Training in Infectious Diseases Jackson Memorial Hospital in Miami, serving as the Chief Fellow for her fellow physicians. Coming from Colombia, a country with many tropical infections, created her interest in the study and treatment of infectious diseases. She specializes in HIV prevention and treatment, managing chronic infections, sepsis or surgical infections, like C Difficile infection, PICC line or Infusion infection, MRSA, Meningitis, Helicobacter pylori infection, Hepatitis and Pneumonia. Dr. Rodriguez is married and lives in St. Lucie County. London Ocon, PA-C recently completed her Master of Science in Physician Assistant Studies at Lincoln Memorial University – Debusk College of Osteopathic Medicine in Tennessee. Upon completion, Ms. Ocon obtained Board Certification from the National Commission on Certification of Physician Assistants. Ms Ocon previously worked as an Emergency Medical Technician in South Carolina before pursuing a career as a Physician Assistant. London completed a Clinical Rotation in Infectious Diseases with our practice and found her passion was in Infectious Diseases. She relocated to the Treasure Coast and joined Associates in Infectious Diseases, P.A. Associates in Infectious Diseases has Nurse Practitioners and Physician Assistants to evaluate and treat patients in our offices, the hospitals, and nursing homes. National Commission on Certification of Physician Assistants. Lisa moved to Port St Lucie in 1983 as a child from Virginia Beach, Va. She began working for Associates in Infectious Disease in 2013 after completing her BSN and MSN at Florida Atlantic University. She has an extensive background in pharmaceuticals and nursing. She began working for HCA in 1996 as a pharmacy technician, moonlighting at Eckerd’s and Walgreens. Her innate desire to help and care for people led her into a career of nursing; completing her LPN and RN at Indian River State College. Lisa was employed by HCA, Lawnwood Regional Medical Center, working as a telemetry nurse for 3 years and then a critical care nurse in the trauma intensive care unit (CCRN) for 4 years. She enjoys the challenges of working in a critical care setting. 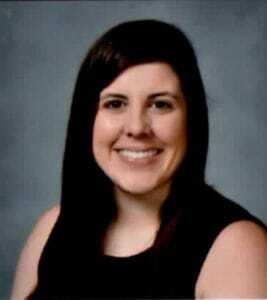 The desire for a challenging and rewarding career has led her into infectious disease. She takes great pride in working with one of the most renowned infectious disease practices in the southeast. Working for Assoc in Infectious Disease has put Lisa on the cutting edge of research and treatment and provided her with a satisfying and rewarding career. 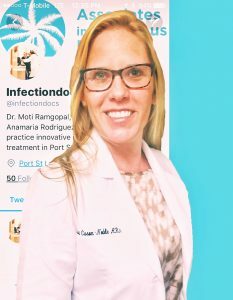 Lisa provides in-hospital infectious disease services to all Martin and St. Lucie County hospitals, specializing in acute infectious disease processes. Dr. Collin is Friendly with excellent bed side manners. He takes his time with his patients, and is never in a rush – he right away came up with diagnosis and treatment plan. when I left there I felt all my questions were answered. His staff is friendly and attentive. The IV suite with Dawn kept me out of the hospital ! Her reassurance and care made going through this ordeal a breeze instead of the ordeal I anticipated. recommend this office anytime. He fought to get my insurance to cover the treatment I needed and advocated for me to help speed up my care with other specialists. 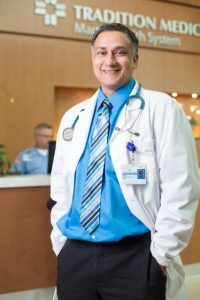 He is a known charitable doctor with his own not-for-profit clinic he runs to help those living with infectious diseases. They should all be like this guy. There are people who should be in this profession and others perhaps not. Dr. Collin imparts to both patient and family a sense of trust and sincerity for which I am very grateful. We provide in-hospital specialty care to treat and manage sepsis or surgical infections, C Difficile infection, PICC line or Infusion infection, MRSA, Meningitis, Helicobacter pylori infection and Pneumonia to decrease your length of stay in the hospital, and improve the quality of your care while an inpatient at the hospital. Outpatient IV infusion treatment offers several advantages to patients, health care providers, and insurers. First, the length of hospital stays can be markedly reduced. Some patients may return home and resume their daily routine days or weeks before finishing therapy. In other cases, IV infusion treatment can be started as soon as the diagnosis is made, and hospitalization can be completely avoided. In-office treatment is almost always less expensive than inpatient therapy. The latest research concludes Iv infusion treatment programs have a high rate of success for a diverse collection of infectious diseases. We also provide travel immunizations and other prevention services.